Experience 2400 sq. ft. of luxury rental. 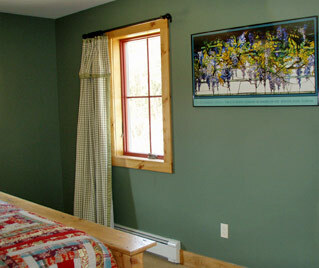 Roaring Brook Guesthouse is so close to Gore Mountain you can see the Burnt Ridge Chair lift from the windows! Oversized mudroom 17' x 11' for storage of coats, boots, boot bags and skis. Full length wooden bench with a shelf to dry boots and gloves. Boot bag cubbies built in to wall next to ski rack. Bulletin board full of brochures on regional activities. Maid's closet. 17' x 14' with wardrobe, dresser and bench, sleeps 2. 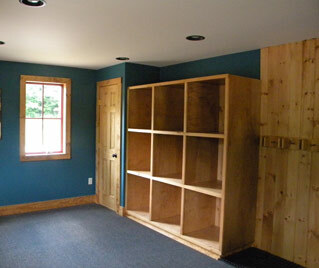 17' x 12' with closet alcove, dresser and bench, sleeps 2. 17' x 13' with twin over full bunk beds and a queen sleeper sofa, dresser, coffee table and end tables. Sleeps 4-5 people. This room includes a 55" flat screen with Blue-Ray player and X-box connections perfect for kids and teens. 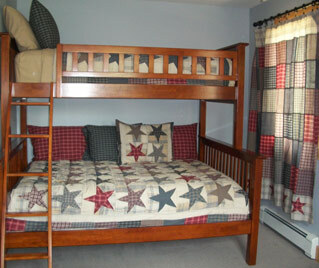 15' x 9' with twin over full bunk beds, sleeps 2-3. 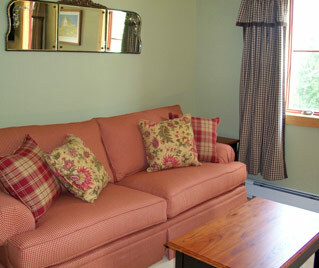 Has two full sleeper sofas to sleep 2-4 additional persons. Includes open shelfs that store extra quilts for the sleeper sofas and for reading a book or watching a movie in front of the gas burning fireplace. Four total consisting of two full baths with shower/tub combination and two half baths to get everyone out on the slopes for first tracks. Bathrooms also include blow dryers, total of 2 in the guesthouse. Historic room 26' x 18' with original heart pine floors and stone fireplace, converted to gas with a timer for ease of use and enjoyment. Two full sleeper sofas and coffee table, two wing chairs, built in shelves for games and quilts for the sleeper sofas and for reading a book or watching a movie in front of the gas burning fireplace. Entertainment center includes 55" flat screen, Blue-Ray DVD player also plays CD's. A collection of music and movies is available in our library and feel free to bring your own. 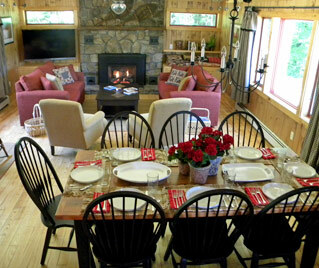 Dining area features a farmhouse table with 8 chairs and additional table leaves. Matching barn board dining area hutch houses elegant wine and beer glasses, coasters and table linens. 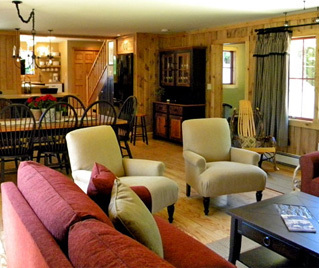 Cable television, Wi-Fi "Roaring Brook" network, local and long distance telephone calls included; international calls must be placed with your calling card. 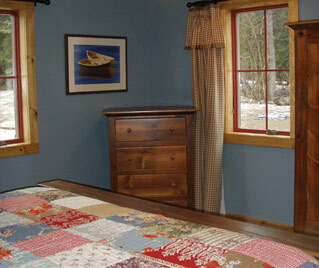 Before your stay you will receive the telephone number for the Roaring Brook Guesthouse. For your convenience a digital answering machine message can be recorded during your visit. Farmhouse gourmet kitchen and bar 20' x 9' with custom cabinets, Kenmore Energy Star appliances including large French door refrigerator/freezer, oven/range, dishwasher and built in microwave with direct vent. 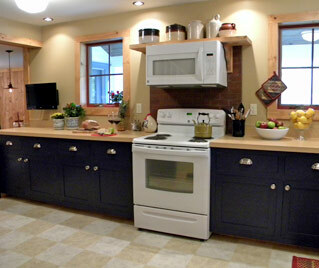 Cabinets under stairwell store small appliances including countertop griddle, toasters and mixer. Kitchen fully stocked with coffee maker, white porcelain place settings for 12 and extra melamine dishes for kids. Cookware, multiple serving dishes and platters, utensils, cutting boards, cutlery and storage containers. Wine rack above fridge. Compliments to the chef with a 20" flat screen television in the kitchen and bar area. Located in hallway for bags of chips, cereal and paper goods storage. Located next to kitchen with Kenmore Elite appliances and laundry baskets. Cotton flannel bedding, pillows, blankets and quilts, luxurious bathroom towels, kitchen towels and place settings included. Simply leave them in the rooms at the end of your stay. Also includes iron, ironing board and sheets, pillows and blankets for the sleeper sofas (1) queen and (2) full. Access from great room, place your glass bottles and cans in bins labeled for recycling. Place kitchen garbage ready for transfer station here. Our caretaker will collect this during your visit and at the end of your stay. Beautiful new clapboard, pendant lighting fixtures, vernacular farmhouse window trim and a custom snowflake design wine barrel. Backyard Fire Ring and BBQ grill with Adirondack chairs and picnic table. Firewood is provided. 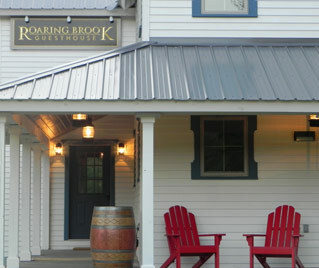 Roaring Brook Guesthouse is an authentic rehabilitation of a farmhouse from North Creek's past. Many recognized the white clapboard house with a pair of blue painted vintage Gore Mountain skis mounted to the siding. "Are we there yet?" The house was the sign that "Yes, we are almost there!" 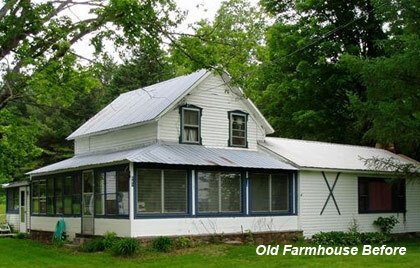 A cut nailed salvaged from the reconstruction shows that the original house is 100 years old. We are proud to bring this old house back to life with a new addition, and to have offered jobs for North Creek skilled craftsmen with Hugh Davis, General Contractor. 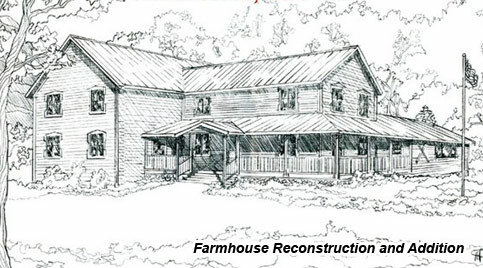 By preserving the original footprint of the house and constructing an addition in the vernacular tradition, we were able to save the original great room while adding sleeping quarters and a generous farmhouse kitchen. Green features include the use of advanced framing techniques, blown in foam and fiberglass insulation with Anderson 400 casement windows exceeding NY REScheck™ requirements. Barn board furnishings, Energy Star appliances, mudroom entry with bench and back mudroom recycling center are all part of the REGREEN design. We would like to thank North Country professionals who were instrumental in designing the new Roaring Brook Guesthouse: Architect Douglas Robinson, AIA and Interior Designer and photographer Jacqueline Newell.